If you’ve ever heard me talk about travel for even a minute, you’ll probably gather that food is one of the main reasons I do it. I often choose a restaurant I want to eat at somewhere in the world and then plan a whole trip around that. I was pregnant in 2016 and this put a bit of a damper on my ability to eat with the best of them since I got heartburn when I so much as drank a sip of a smoothie. Fortunately, I was able to get back to my old ways in 2017. Justin and I ate some of the best meals of our lives with Wylie in tow*. My main goal with this list is to help you chart an outstanding year of eating and drinking in 2018. *For some of the more extensive meals we did arrange sitters. We’re not that crazy. We kicked off 2017 with a trip to Argentina. Justin and I had always wanted to spend New Years Eve somewhere hot. It was about 95 and humid while in Buenos Aires, a little brutal to be honest, but we had a wonderful time with our good friends and then we flew to Mendoza where the weather was much more manageable. We have good friends there too and one balmy night they held an asado, the famed Argentine-style bbq, for us in their backyard. The food was incredible. An Argentine bbq is a carnivore’s utopia. Cooked on their built-in parrilla (wood-fired grill), our hosts grilled blood sausages, juicy short ribs, flank steak and tender lomo (beef loin) and other cuts that I had never heard of before. Served with a simple tomato salad dressed with good quality olive oil and bottle after bottle of juicy Malbec, the meal was flawless. I know this is not necessarily a repeatable experience, but if you’re ever in Argentina and get invited to a real asado, go! Francis Mallmann’s 1884 Restaurante in Mendoza and Siete Fuegos in the Uco Valley serve excellent, and authentic, grilled meats. A table beneath a grape arbor at Hotel and Restaurant Garzón. We dubbed our South America trip the Francis Mallmann tour because, in addition to dining at Siete Fuegos, we also went to Garzón in Uruguay. Mallmann’s hotel and restaurant in a former staging post in the Uruguayan hills is like a dream. The hotel and restaurant is located in the town’s former general store. Dishes are cooked in a roaring wood-fired oven and served at outdoor tables beneath grape vine-covered arbors next to a bright blue pool. Grilled octopus with tangy slices of bell pepper, grilled peach and burrata salad, a whole fish with chimichurri and a grilled ribeye were among the highlights. Wines are all from Bodega Garzón, the splendid local winery. Spritzy wine-based cocktails were served as an aperitif and could be ordered beneath an exotic tent on the hotel’s lawn. Staying at Hotel and Restaurant Garzón is expensive. It costs $780 for double occupancy for one night, but this includes your room, breakfast, lunch and dinner, house wines and bikes to use during your stay. When you consider that dinner could easily cost around $300 for two people, this suddenly doesn’t seem like such a bad deal after all. Parador La Huella is located on the sand. 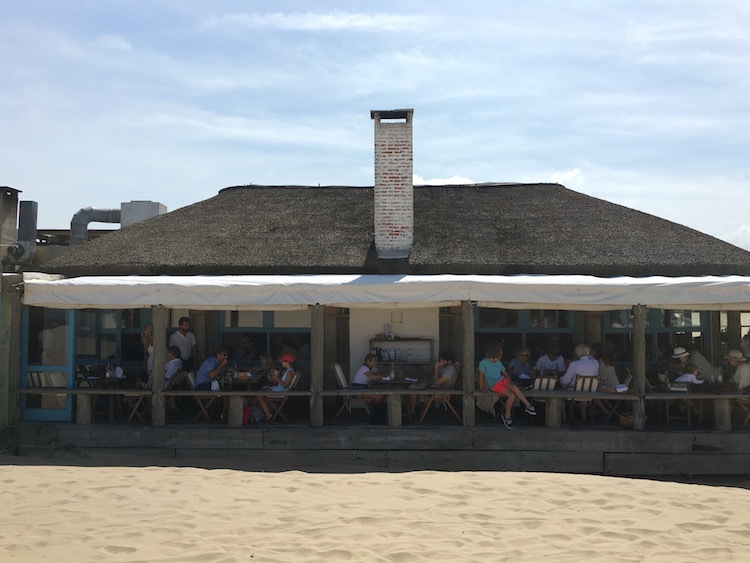 Just 30 minutes from Garzón, in the chic beach enclave José Ignacio, lies what may be Justin and my favorite restaurant in the world. On our first visit to Uruguay, we ate at Parador La Huella three times. 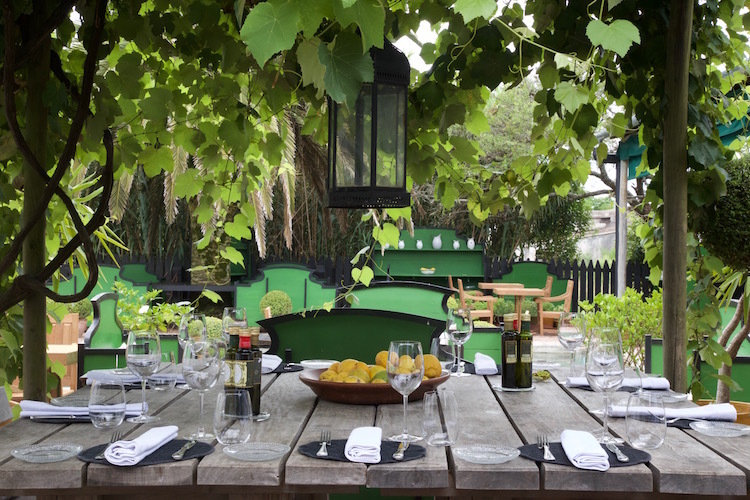 On this particular visit, we chose to eat there both nights we were in José Ignacio. The oceanfront restaurant, located in what feels like rambling beach house with a fireplace, a thatched roof and wooden terraces, is the most idyllic setting I can imagine for eating fresh seafood and fire-grilled meats. On the first night, we ate a flaky whole grilled white fish, smashed potatoes and squid paired with a mineral Bodega Garzón Sauvignon blanc. Simple and perfect. I participated in the Women’s March in Washington DC is January of 2017 with my mom and three sisters. Ofourse, our trip was about something bigger, but we still managed to squeeze in some excellent meals at Tail Up Goat and Rose’s Luxury. The towering lasagna at Tail Up Goat made with braised goat meat, tomato sauce, housemade pasta sheets and a green sauce made with lemons and anchovies was a highlight. The bottles are lined up for a tasting at Domaine Jacques-Selosse. 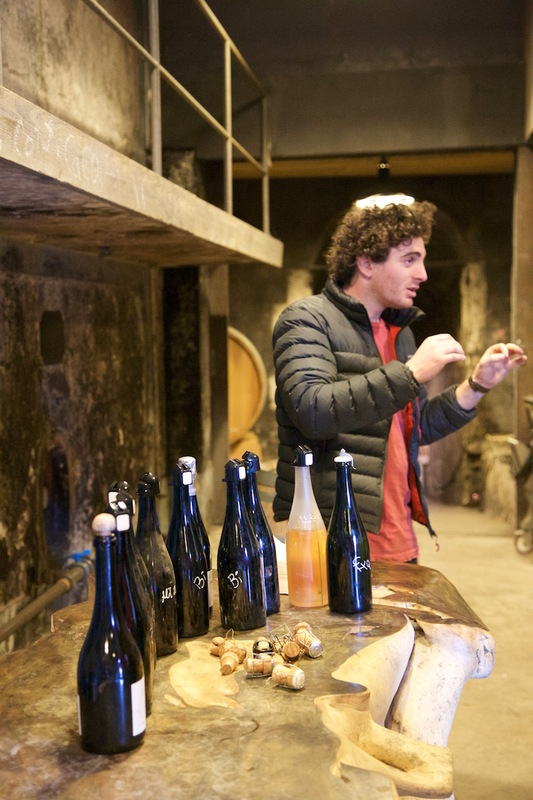 When we embarked on our tour and tasting at Domaine Jacques-Selosse in Champagne, we knew we had stumbled on something special. We were staying at their hotel that night and when we booked our room, they told us we would be able to get in on a tasting at the notoriously difficult to book domaine. A tasting group included a couple from China, two aspiring Sommeliers and a wine buyer. The son of the winery and hotel owner did the tasting. After showing us around the winery and allowing us to taste straight from the barrel, he asked what bottles everyone like to taste. Our companions rattled off the names of champagnes they were interested in and our guide began popping bottles. Everyone clamored for a pour of each one. This tasting gave me a new found appreciation for wines of the sparkling variety. Each wine we tasted was complex, terroir-driven and unique in its own right. We tasted bottles that are impossible to buy. 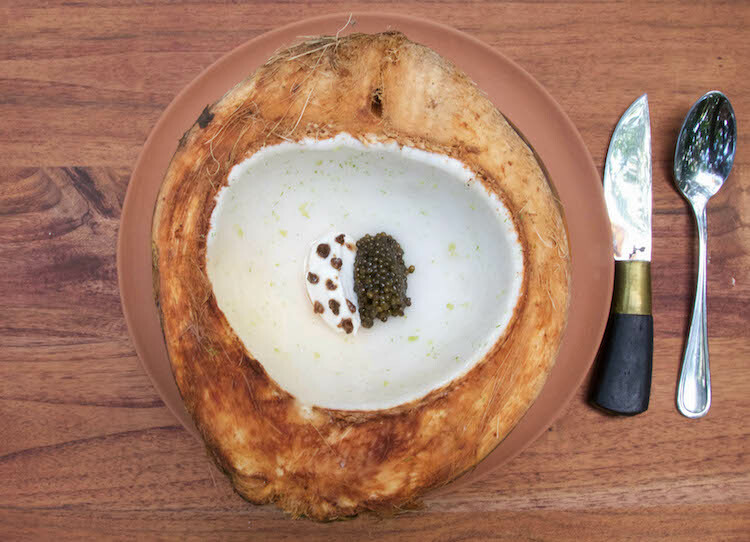 Young coconut with Petrossian caviar and lime zest. 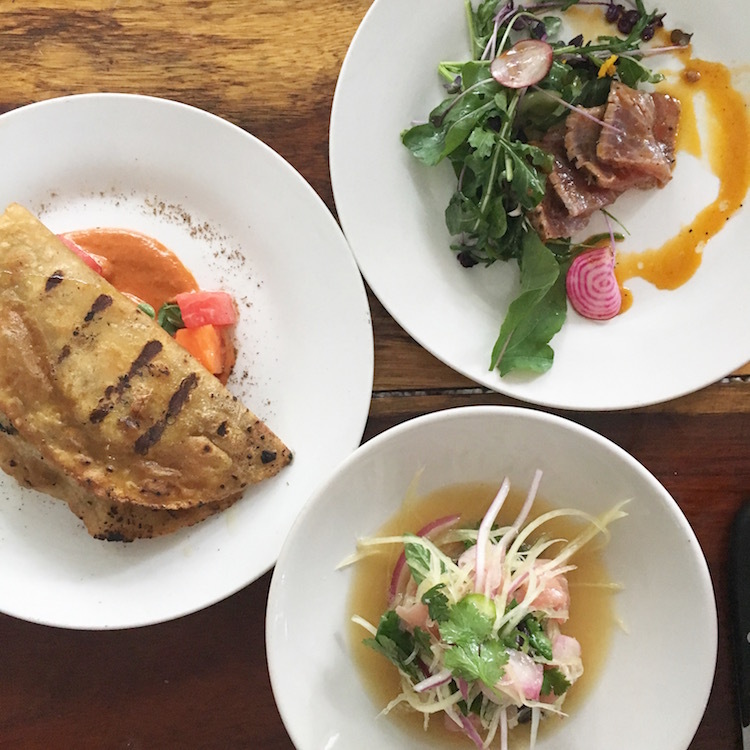 When I heard noma was going to have a pop-up in Tulum, I thought, this is a great excuse to go to the bohemian beach town I’d been hearing so much about for the last five years. Unfortunately, getting a reservation wasn’t quite so easy. Tables for two sold out within an hour of being released. We got on a waitlist and luckily something did become available after the first of the year. We stayed at Papaya Playa Project. They were able to arrange a sitter for us the night of our dinner at noma. Staff in stylish white shirts and tan aprons greeted us at the entry to the all outdoor restaurant. The restaurant may have been temporary, but it felt very authentic. Mayan women made tortillas throughout the meal. The ingredients had been painstakingly sourced from the Peninsula and other regions of Mexico. There was the signature noma flair. Composed dishes like Melon clams dusted with sea greens powder, chaya leaf filled with Bahia Falsa oysters and served with kelp bulb injected with a mussel-flavored michelada, young coconut with lime zest, Russian caviar, and kelp salt and octopus with dzikilpak, noma’s take on the pumpkin seed–and-tomato sauce made in many Mayan households, were inventive, challenging and, almost, too beautiful to eat. Noma’s Mexican pop-up is alas closed, but the brand new iteration of noma in Copenhagen where menus are based around three distinct ingredient “seasons” opens in February 2018. We almost didn’t get in to this legendary restaurant in a tangle of jungle in Tulum. I started emailing months in advance and was told to email again closer to the date of our trip. When I did just that, crickets. Our trip was over the Easter holiday and I was starting to worry that the restaurant was going to be closed during our travel dates. When we arrived in Tulum, we immediately went to the restaurant to see what the deal was and my worst fear was confirmed. Luckily, we had one night to play around with at the end of our trip. I decided we would return to Tulum when the restaurant would be open and try our luck at walking in. Somehow, I stumbled on a blog post that said a line started forming outside the restaurant at about three in the afternoon for whatever tables were still available on the day. I arrived promptly at three. A line had already formed. The host started taking names and I was able to confirm a table for 5:30pm, right when they opened. The meal was absolutely incredible and the appetizers including sweet and spicy papaya empanadas, seared bonito, and fresh and limey ceviche with cilantro, were the highlight. Hartwood has a new policy where it takes reservations by email exactly one month in advance of your desired date so plan accordingly! Justin gave me a trip to one of our favorite restaurants/hotels, The Willows Inn, for Christmas and so in May we found ourselves back on the pristine island in a beautiful guest room overlooking the sea. Children aren’t allowed in the dining room at The Willows at dinner time, but the hotel was very helping in arranging a sitter. After she arrived, all we had to do was sashay downstairs to an outdoor table where we enjoyed a cocktail and small bites including sidestripe prawns. Inside, our tables was perfect positioned by the large picture window. We enjoyed dish after dish including grilled geoduck clam, aged venison leg, dungeness crab soaked in pine nuts and aromatic black cod cooked in currant leaves. I found breakfast the following day to be stepped up a notch from our previous visits. The tapas-style breakfast featured buckwheat crêpes with rhubarb compote, radishes in butter, cured salmon, local honey and wilted greens. 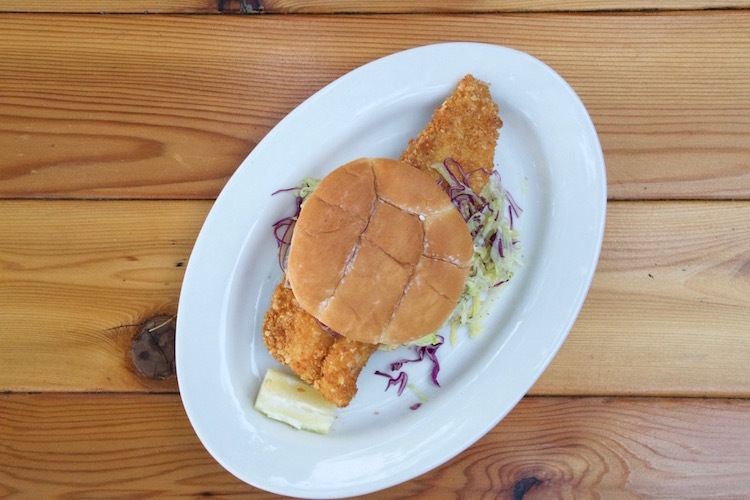 The fish and chip sandwich at Suttle Lodge is perfection. I had been dying to go to The Suttle Lodge ever since it changed ownership in the fall of 2016. Owned by the same people as the Ace Hotel in Portland, I knew I was going to love it and I had heard the food was incredible. When we arrived one Monday night in May, I was disappointed to learn that the Boathouse Restaurant wasn’t open yet mid week, but the Lodge restaurant was open and it was serving the fish & chip sandwich I heard so much about. I stayed at the hotel with my sisters, our babies and our husbands and we pretty much had the entire lodge to ourselves that night. After enjoying cocktails, like a perfectly sweet and frothy whiskey sour on the patio at golden hour, we took over a large table inside for dinner. Nearly everyone ordered the fish and chip sandwich. Trout battered in Kettle potato chips was crispy and the perfect contrast to the soft steamed potato bun. Tangy tartar sauce and fresh cabbage completed the sandwich. The Troisgros dining room is referred to as the forest without leaves. I drooled over the French Chef’s Table on Netflix and the episode on the famed three Michelin star restaurant Troisgros in Roanne in particular. The news that it had moved to a new location in an ancient farm outside of town made me want to go even more. Justin, Wylie and I visited in November 2017. We stayed in a guest room overlooking a small garden with simple Scandinavian design. The hotel and restaurant arranged a sitter for us the night of our meal. When we arrived for dinner, we were shown the pristine kitchen, framed on three sides by glass and then taken to our table. 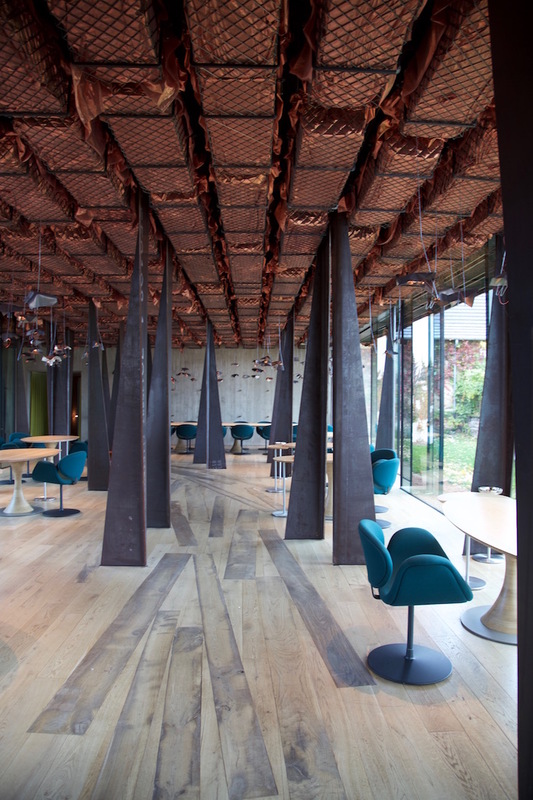 The restaurant is know at Le Bois Sans Feuilles which basically translates to the forest without leaves and this makes sense when you see the dining room. The horseshoe-shaped glass structure surrounds an oak tree in a small courtyard and steal pillars throughout the restaurant seem like modern tree trunks. Trees leaves are not attached to the pillars but they are evoked by a copper-colored material that dangles from the ceiling in some places. Our 11 course meal was divine. Petrossion caviar with shaved squash, buckwheat and a dollop of cream was perfectly balanced between salty, sweet and earthy. Scallops with a pungent marinated garlic, shaved hazelnut and hazelnut mousse struck me as the perfect fall dish and a rice pudding dessert with a dusting of toasted bread was beautiful simple in it’s flavor and presentation. It looked like a snow covered hill and smelled like a smoldering fire. Wine, including a flinty Sancerre, and a Saint Aubin 1er Cru with cherry notes, was also delicious. Our Thanksgiving feast in Paris. 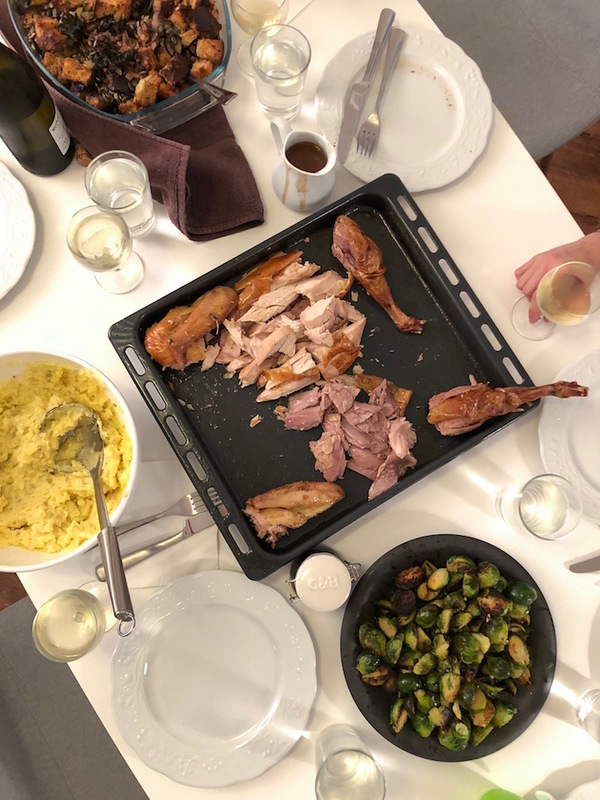 We spent Thanksgiving in Paris in 2017 and I ordered a turkey from the organic butcher at the Bio C Bon on Rue Bretagne. He said he could get me a turkey from Bresse, the absolute best you can buy, he told me. I knew poulet (chicken) Bresse was excellent so I figured this would be good as well and might warrant the hefty price tag. I used Bon Appétit’s Dry-Brined Roast Turkey recipe and began prepping the turkey the night before. I began cooking the turkey at about 5pm the next day. After about 30 minutes, it already had that perfect golden color and I hadn’t even finished making the basting mixture yet. Panicked that it might dry out or burn I doused it with rosé wine. I finished the basting liquid, a mix of butter, rosemary, garlic and soy sauce and continued cooking it as instructed. The turkey turned out great. One of our guests was a chef and she said it was excellent, so that made me feel really good. I’m not sure if it was my cooking or the meat or both, but it was the most succulent and flavorful turkey I’ve ever eaten. The white meat was delicious, but the dark meat was perfectly tender and sweet. It was the turkey for any-one who claims they don’t like turkey. We rounded out 2017 with a trip to Valle de Guadalupe with friends and family. On the first night, we ate at the wood-fired grilled restaurant Deckman’s. We sat next to a vineyard and watched as the sky turned from blue to golden to purply/pink and finally to black. We feasted on Baja oysters, abalone, quail and a massive ribeye steak seared on the outdoor grill. For lunch the next day we went to Javier Placencia’s torta truck Lupe, next to his excellent Finca Altozano restaurant. It was quick and casual, but we were blown away by the quality of the food. We ordered a pickle plate with sour and spicy cauliflower, carrots and brussels sprouts. 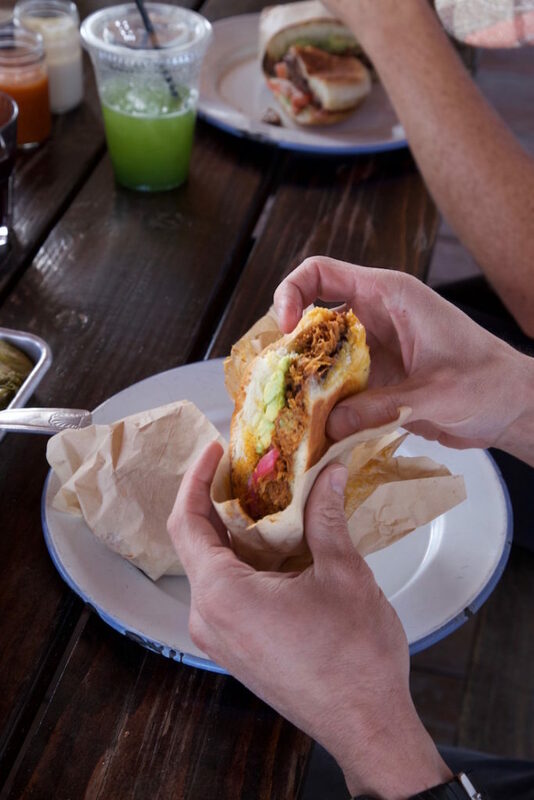 The french fries seemed like they had been cooked twice and the sandwiches, including a tangy and sweet cochinita pibil, were amazing. I would eat here every week if it was in San Diego. 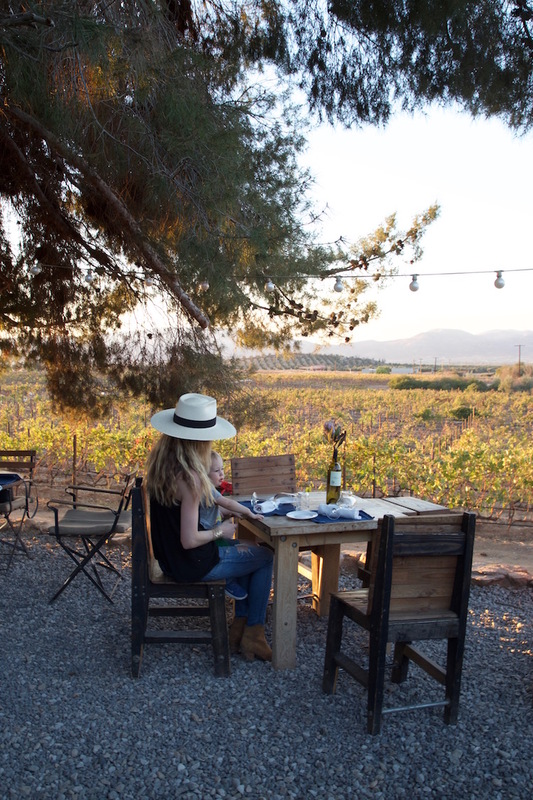 Bruma winery, made of reclaimed materials and located on a hillside with beautiful news of the valley, is one of the most impressive in Valle de Guadalupe. The winery’s new restaurant Fauna is equally impressive. Diners sit at one long communal table that appears as if it’s suspended from the ceiling. Our meal was served family style and we loved everything. It began with chocolate clams with fermented habanero and lime, followed by aguachile with cucumbers and yellowtail and small pieces of zucchini and octopus with tomatoes and grilled romaine salad with corn salsa. The grand finale, a shredded lamb dish, came with a side of butternut squash with chipotle salsa that was simply the best butternut squash I’ve ever tasted. A bottle of Casa de Piedra Blanc de Blancs was the perfect compliment to the spicy food.